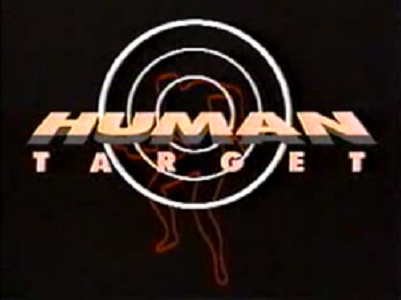 I wrote about 'The Human Target' before. 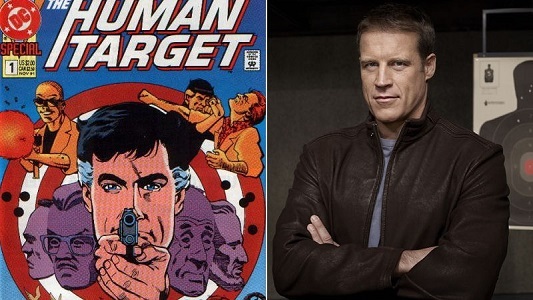 In the late 20Naughts, I dealt with the second incarnation of The Human Target - Christopher Chance as played by Mark Valley. I really liked that show but I couldn't use it for the main Toobworld for two reasons. 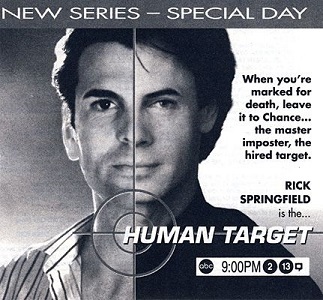 1] Earth Prime-Time already had its own Christopher Chance, the Human Target - in 1992, Rick Springfield played the role in a short-lived series of only 8 episodes. 2] In one episode of the remake, the Royal Family of England was featured but they were in no way the same as that to be found in Earth Prime and Earth Prime-Time. So I don't think I could even place that version of 'The Human Target' in Toobworld2. 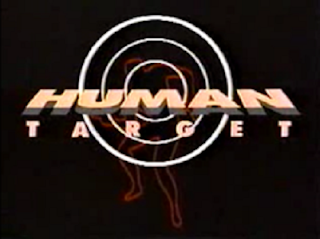 If the ratings indicated there was interest, The Human Target could be prepped for his own show... again. 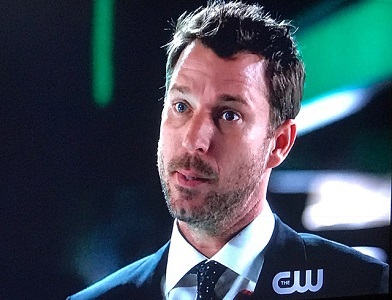 Personally, I'd like to see him teamed up with Constantine. One uses magic; the other is a no-frills master of disguise. 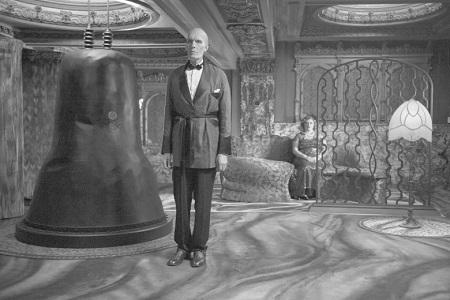 Carel Struyken has returned to the new incarnation of 'Twin Peaks' as The Giant (although he was listed in the end credits as "????????") in what most likely will be the 2017 Toobits Award winner for Best Episode Any Genre ("Part 8" or "Gotta Light?" if you need something more specific.) Although it was all very confusing, I got the sense that The Giant was instrumental in combating the forces of the Black Lodge who were unleashed by the 1945 A-Bomb test and who then went on to create BOB. Previously, The Giant had appeared in at least five episodes of the original show's second season. That was back in 1990, but could we have seen The Giant earlier in the Toobworld Timeline? Actually, the name of his character was given, but whoever edited this page for the IMDb failed to do the research. The Giant of "Fairytale Theater" was named Frank Lydaczech, who spoke with Luther about the concept of size. Standing at 7 feet tall, the Dutch actor gets many of those roles in which height plays a key role. But I'm not sure we can conflate both roles to be the same person, even if Struyken is the actor in both and they both share the same generic title. 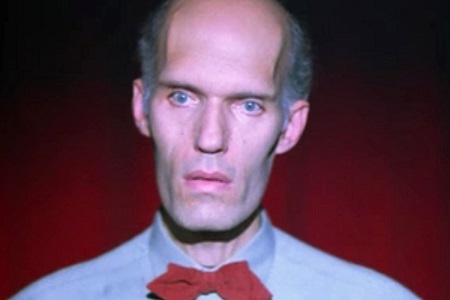 The theory might have been viable if 'Twin Peaks' had never come back and so we didn't see that The Giant was already some kind of cosmic being back in the 1950s. Although I suppose he could have made himself a tangible humanoid on Earth Prime-Time, with the alias of Frank Lydaczech in order to make contact with Luther at St. Eligius Hospital. We saw him collapse in the snow at the end of the episode with the intimation that he had died, but it could have been that he slipped into unconsciousness. We just never saw a follow-up to his story, one way or the other. If he was The Giant of 'Twin Peaks', it could be that he could not survive under the conditions of the main Toobworld's plane of reality. Since we never saw a follow-up, perhaps "Lydaczech" transferred his essence back to the alternate dimension from which he came. There are those who buy into the idea that all of 'St. Elsewhere' took place in the mind of Tommy Westphall, who was autistic. I'm not one of those people. The final scene of the series was part of Tommy's imagination, but everything else leading up to that was "Realiteevee". Besides, it's not like Tommy could have dreamed up The Giant as being from 'Twin Peaks' since that show wouldn't hit the airwaves until 1990. I'm dismissing that idea outright, but I'm not going to declare one way or the other that we could have seen the 'Twin Peaks' Giant in 'St. Elsewhere'. 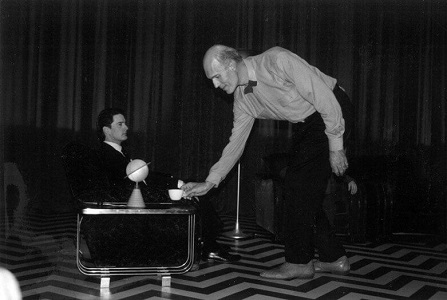 'Twin Peaks' in ongoing and Mr. Struyken's role may have more to offer us. I think that considering the wild artistic vision of David Lynch, anything may yet happen. But when the time comes when I could make a deliberate claim, I think I would have to rule in favor of the blended realm of Toobworld. HISTORY CHANNELED - RICHARD PRYOR & "THE BATTLE OF THE SEXES"
The show jumped ahead a few months from last week; it's now September of 1973 and the historical touchstone is the "Battle of the Sexes" tennis match between Bobby Riggs and Billie Jean King. Suddenly in the national limelight following his win over [Margaret] Court, [Bobby] Riggs taunted all female tennis players, prompting [Billie Jean] King to accept a lucrative financial offer to play Riggs in a nationally televised match that the promoters dubbed the "Battle of the Sexes". The match, which had a winner-takes-all prize of $100,000, was held in the Houston, Texas Astrodome on September 20, 1973. Riggs was given $50,000 to wear a yellow Sugar Daddy jacket during the match, which he took off after three games. Riggs also placed many bets on and invested a lot of money in the match. King entered the court in a chair carried by four bare-chested muscle men dressed in the style of ancient slaves. Riggs followed in a rickshaw drawn by a bevy of scantily clad models. Riggs presented King with a giant Sugar Daddy lollipop, and she responded by giving him a squealing piglet. King won the match 6–4, 6–3, 6–3. In the first set, she initially fell behind four games to two. In a 2015 interview, she said that most people don't remember that she was initially behind in the first set, and it looked bad for her in the early going. She added that, at this point, she realized that she "had to win" given the importance of the match. King had learned from Court's loss and was ready for Riggs' game. Rather than playing her own usual aggressive game, she mostly stayed at the baseline, easily handling Riggs's lobs and soft shots, making Riggs cover the entire court as she ran him from side to side and beat him at his own defensive style of play. After quickly failing from the baseline, where he had intended to play, Riggs dropped his comedic affect and showed a more serious demeanor, as he was forced to change to a serve-and-volley game. A few critics were less than impressed by King's victory. King was 26 years younger, and some experts claimed that it was more an age versus youth game. According to Jack Kramer, "I don't think Billie Jean played all that well. She hit a lot of short balls which Bobby could have taken advantage of had he been in shape. I would never take anything away from Billie Jean — because she was smart enough to prepare herself properly — but it might have been different if Riggs hadn't kept running around. It was more than one woman who took care of Bobby Riggs in Houston." Before the match, however, King had forced the American television network ABC to drop Kramer as a commentator. King said, "He doesn't believe in women's tennis. Why should he be part of this match? He doesn't believe in half of the match. I'm not playing. Either he goes – or I go." After the match, Pancho Segura declared that Riggs was only the third best senior player, behind himself and Gardnar Mulloy, and he challenged King to another match. King refused. Despite some of the comments downplaying the loss by Riggs (or victory of King), following the match Riggs was "devastated" and isolated himself in his hotel room for four hours. The match had an audience of an estimated 90 million worldwide (50 million in the US). The attendance in the Houston Astrodome was 30,472, as of 2012 the largest audience to see a tennis match in US history. "The Battle of the Sexes" also served as a symbolic representation of the ongoing battles between club-owner Goldie Herschlag and her ex-husband, comic Sid Robbins. She may have been able to humiliate him in public by letting him perform on the main stage - but right after Richard Pryor, but he proved to be despicable by showing her his back-hand, making him a worse pig than Riggs ever could be. Speaking of Pryor, he showed up-and-comer Adam Proteau a few tips and coaxed the younger comic to add the more disturbing aspects in his relationship with his father to his comedy act. But agent Barton Royce gave Adam the benefit of his wisdom by advising him not to follow down the same meteoric path that Pryor was on. September of 1973 means that Pryor was just coming off his involvement with the production of "Blazing Saddles", which would open in February of 1974. Being one of the pool of writers working with Mel Brooks on the film, he was probably done even earlier in the year. Brooks supposedly wanted Pryor to take on the role of Sheriff Black Bart, but the studio nixed that because he was too "dangerous" and so Cleavon Little got the role. 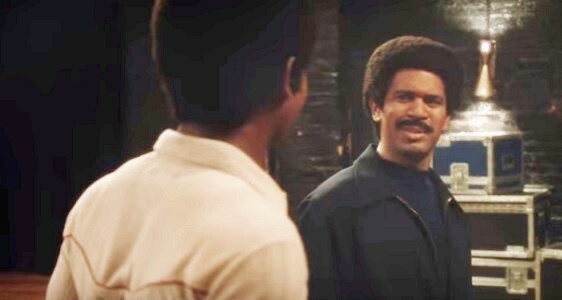 Pryor had been in movies already, mostly in small roles, usually members of a team of players as in the TV movie "Carter's Army" or "Bingo Long And The Travelling All-Stars". But he had key roles in movies like "Lady Sings The Blues" and "Uptown Saturday Night" and "Car Wash". It would be two years after "Blazing Saddles" when Pryor really made his mark in the movies by teaming up with "Blazing Saddles" co-star Gene Wilder in "Silver Streak" which led to a series of films together. THEORY OF RELATEEVEETY: "TWIN PEAKS" TWINS? And that should have been the end of the Renault family crime dynasty. But now 25 years later, we have a new relative by that surname - Jean-Michel Renault. He must be related, although there is still some splainin to do as to what the exact connection is. To look at Jean-Michel, one might think that he was Jacques' twin brother, not just a look-alike half brother or "Identical cousin", but a legitimate twin brother. Until we find out otherwise, I'm going to consider Jean-Michel and Jacques Renault to be "identical cousins", in the deeper Toobworld suggestion of them sharing the same father. That he also bears the family name would mean that the father of the Renault brothers had a relationship with his sister-in-law, or perhaps with a cousin, or - this being Lynch country - with his own sister. That would make Jean-Michel the half-brother and cousin to the other Renault boys. We shall view what we shall view. 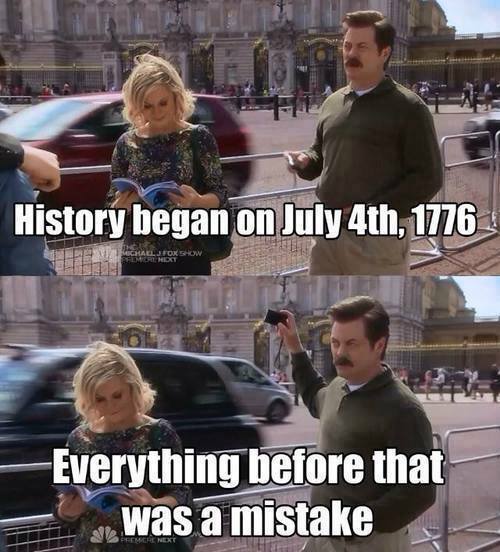 Two for Tuesday for the Fourth! 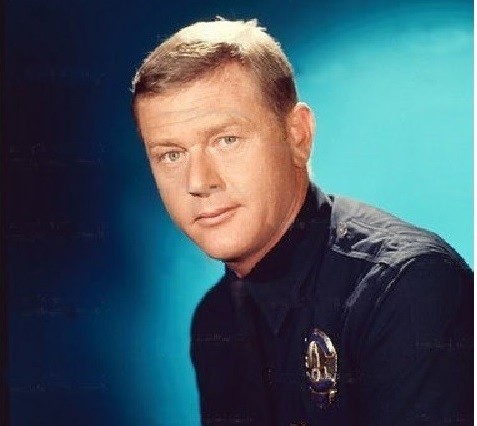 Martin Milner, one of the great yeomen of the TV Universe, passed away in September of 2015. 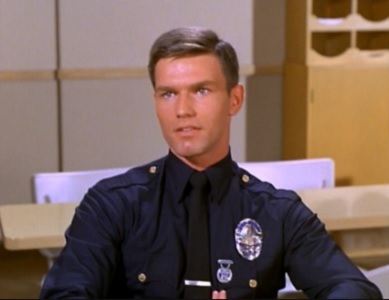 As was the case with our salutes to Robert Vaughn as Napoleon Solo and Mary Tyler Moore as Laura Petrie, it just didn't feel right to induct Milner as Pete Malloy from 'Adam 12' without his partner, Jim Reed who was played by Kent McCord. 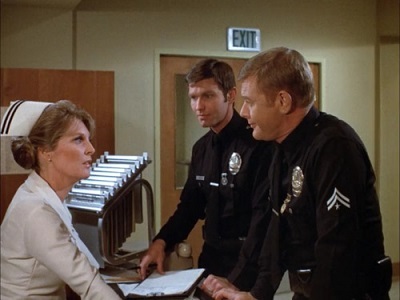 'Adam-12' is a television police drama that followed two police officers of the Los Angeles Police Department (LAPD), Pete Malloy and Jim Reed, as they rode the streets of Los Angeles in their patrol unit, 1-Adam-12. 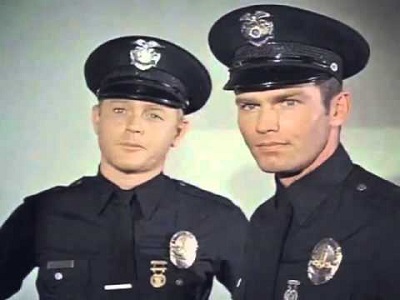 Created by R. A. Cinader and Jack Webb, also known for creating 'Dragnet', the series starred Martin Milner and Kent McCord and captured a typical day in the life of a police officer as realistically as possible. 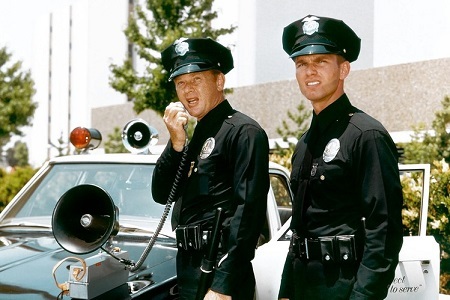 The show originally ran from September 21, 1968, through May 20, 1975, and helped introduce police procedures and jargon to the general public in the United States. 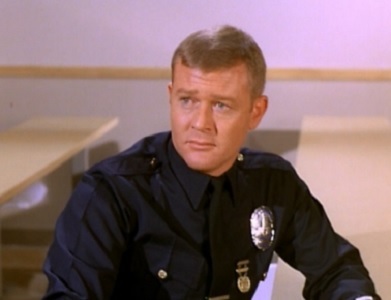 'Adam-12' was a realistic-style police drama following the lives of two officers of the Los Angeles Police Department, veteran Police Officer II (P-2) Pete Malloy, Badge 744 (Martin Milner) and his rookie partner, probationary Police Officer I (P-1) Jim Reed, Badge 2430 (Kent McCord). 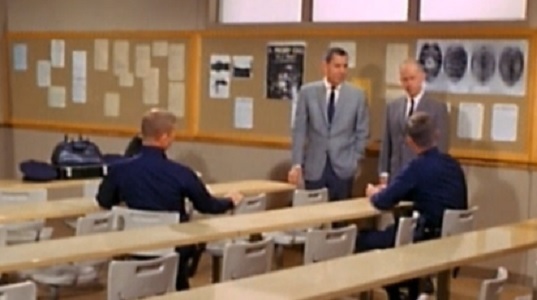 Each episode of the series, like those of Dragnet, was based on actual cases with names changed to protect the innocent, and covered a variety of incidents that the officers encountered during a shift, from the tragic to the trivial. 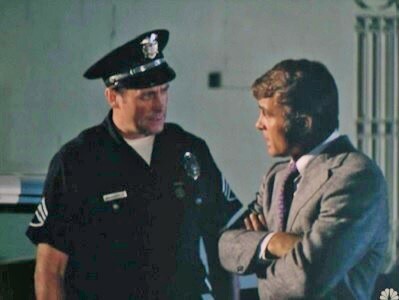 On what is to be Malloy's last shift, the watch commander Lieutenant Moore (Art Gilmore) assigns Malloy to take the young, raw, rookie Reed out for his first night on patrol. Moore was Malloy's first training officer seven years earlier. While Reed shows tremendous potential on his first night on the job, Malloy realizes that his new partner has plenty to learn, and with renewed purpose the veteran officer decides to stay on the job and guide Reed during his nine-month probationary period. His comment to Reed at the end of their first watch together was: "I couldn't turn you loose on the citizens of Los Angeles, not without a leash." How can you break up a team like that? 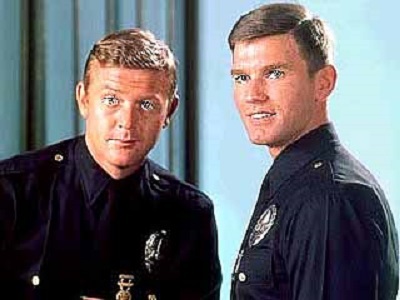 They both appeared on 'The New Adam-12', but in separate episodes. 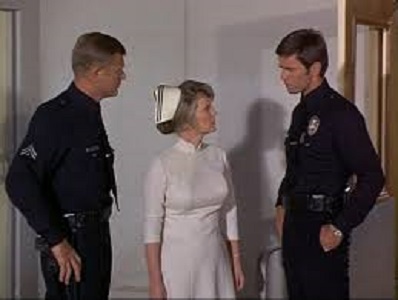 'Dragnet', 'Adam-12', and 'Emergency!' take place in the same universe and depict different aspects of the public safety infrastructure of Los Angeles, California. There are several "crossover" episodes on each series with characters from other Mark VII shows. Officers Pete Malloy and Jim Reed appear on the Dragnet episode "Internal Affairs: DR-20", The D.A. episode "The People vs. Saydo" (the conclusion to a crossover that begins on "The Radical") and the Emergency! pilot movie, "The Wedsworth-Townsend Act". So here's to you, Boys in Blue. Welcome to the TV Crossover Hall of Fame! I'm subscribed to a great blog called "Archive Television Musings" which takes a detailed look at old TV shows not so readily accessible. Currently our host has been examining the 1950s 'Invisible Man' series, episode by episode. The exact title of the show gives credit to H.G, Wells, but that was probably for copyright purposes? I don't really see the connection to the original novel save for a guy being invisible and there's nothing about the series that says it has to be the only invisible man show in the main Toobworld. So far, nothing about the three shows that followed (at least) gives me concern that they should be jettisoned to some other TV dimension. I think they can all remain on Earth Prime-Time, independent of each other. I do have a theory of relateeveety about this show in regard to the main character. Peter Brady, in my opinion, is the uncle to Mike Brady of 'The Brady Bunch' and young Peter Brady was named after him. The show has also provided two new Mideast locations: the country of Barat and Bay Akim. Until I can verify it for myself, I will consider Bay Akim a port city of Barat. So, to while away this day of rest, why not enjoy a few hours in the company of a man you cannot see?